I was recently at a marketing conference where the main theme was Inbound. Thanks to Brian Halligan at Hubspot, “inbound” is now almost a household word. He put a name to what is surely one of the more powerful phenomena shaping the business environment, and by extension the selling environment, today. For the record, the conference to which I'm referring was not Hubspot’s own "Inbound13" held last fall. At that event, the recurring theme was “Be Remarkable” and it was best embodied in Seth Godin’s brilliant keynote address. The two recurring themes heard most at this other event, were that inbound marketing was, on average, bringing prospects 70 percent of the way to the sale, and that companies did better when technology people worked closely with the marketing department. Each of these statements is true. Yet each has a glaring hole. You might have heard this before, but just because we know tomatoes are fruit, doesn’t mean we put them in fruit salad. Let’s take the first one first - that prospects are 70 percent of the way toward making a purchase by the time marketing hands them off to sales. Ask yourself if you have any salespeople at your company who possess a gazillion contacts, a stuffed pipeline, and lots of meetings and conferences to attend, but only a trickle of business falling out of the end of the funnel. Marketing is doing a better job than ever, but the elite salesperson will understand the pitfalls inherent in the overdeveloped lead. We normally like baseball analogies here, but ‘tis the season to talk gridiron. 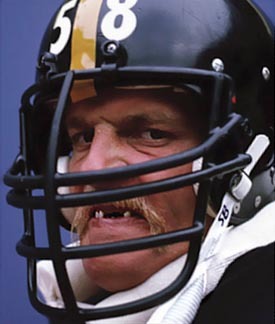 So imagine you’re the Cincinnati Bengals offense, Ken Anderson, in September of 1976 up against the defense of Mean Joe Greene and Jack Lambert (pictured above), et al. of the Pittsburgh Steelers. Don't worry if you're not sure what that means. The Steelers defense that year was arguably the best in the history of the NFL. Suffice it to say that being on the Steelers 30-yard line didn’t mean much. If you were up against their defense, you probably weren't going to close the deal if you were on the 2-yard line. Ken scored 6 points in that game. Later in the season, he played them again and scored 3 points. Again, for the uninitiated, that's not a lot of points. There are actually two problems when a salesperson starts on the 70-yard line. One is that the last 30 yards is the toughest, especially when you start there, and two is that you’re simply standing on the wrong part of the field. At 70 yards, your prospect wants a proposal, a demo, pricing, and references. An elite salesperson will not take the bait. It will only lead to an endless chase scene in a bad movie. Rather, thank your marketing department and then walk your prospect back to your own 25-yard line so you can drive them down the field properly. In today’s world of selling, the salesperson makes the difference. Marketing is an important ticket to the game, but when everyone’s website looks the same, the difference is the salesperson. Remain present and unemotional at the close. This is a subset of the consultative skill set. Can all of your sales people do that, every time? Last week Frank Belzer, author of Sales Shift, wrote an important article on the Architecture of a Sales Force. And Dave Kurlan, author of Baseline Selling, wrote a piece that you shouldn’t miss on Sales Methodologies, an often misunderstood concept. If you’re wondering about the capabilities of your own sales force, it might be time for an evaluation. Join me and a panel of sales experts for a powerful, one-hour webinar that will address the topics the Kurlan team has been writing about this month. The webinar is on February 5th and we will discuss, "Leading Your Ideal Sales Force - Part 1" at 11 AM Eastern Time.